With the winter holiday season nipping at our heels, I went on an inspiration hunt for fresh and friendly creative cognac concoction ideas. Cognac is my favorite cold weather spirit, whether neat or mixed. It’s warm earthy notes and fragrant nose warm the cockles of my heart. Transforming traditional drinks into Winter Holiday Cognac Cocktails became a pre-winter week labor of love. My first conquest was the classic 1940’s Moscow Mule made with vodka, ice cubes, freshly squeezed lime juice and spicy sparkly ginger beer. My twist on the old favorite replaces the vodka with cognac, adds seasonal Clementine or Mandarin juice and some gorgeous garnishes. The fragrantly sweet Clementine citrus compliments the cognac, while the ginger beer augments its spicy undertones. Candied ginger skewered with golden fruit (or kumquat) adds a tasteful touch to this modern Cool Mule. Combine cognac, Clementine and lime juices. Pour over ice, top with the ginger beer and stir. Serve garnished with skewered candied ginger and Golden Fruit, or if not that is available, whole kumquat or Clementine wedge. To make the candied ginger, bring the sugar and water to a simmer until the sugar is dissolved. Add in the sliced and boil until the ginger is tender, about 15 minutes. Remove the ginger syrup from heat. With a fork or tweezers, pull out the ginger slices and cool on a wire rack sitting on top of a parchment paper lined plate or tray to catch any drips. Reserve the ginger syrup in a sealed jar for many other spectacular uses. It will crystallize and can be revived by a small amount of hot water. Let the wet candied ginger slices dry until they are just tacky but do not stick to your fingers, about 30 minutes to an hour. Toss them in superfine sugar and let them dry in a single layer on a clean piece of parchment paper for about hour or so. Dissolve ½ cup of Granulated Cane sugar into ½ cup of water by bringing it to a boil for about 3 minutes. With a slotted spoon, lift the coated cranberries out of the syrup and drain on a wire rack resting on a parchment paper lined ½ sheet pan. Let cool and dry for about an hour. Place the remaining 1½ cups of sugar in a small bowl. Prepare a clean sheet of parchment paper on a pan to receive the candied cranberries. 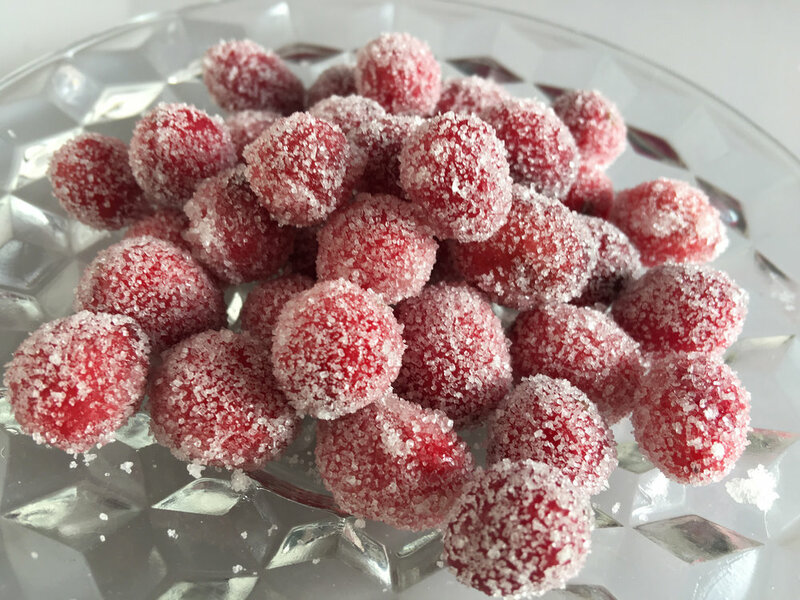 Roll the cooled coated cranberries, a few at a time, into the sugar bowl. The cheery red color of the classic Jack Rose lends itself to this holiday rendition. Grenadine, AKA - pomegranate syrup, is the ingredient that gives the rose color to the cocktail’s surname. Seasonal pomegranates permeate winter produce markets making their seeds the perfect holiday garnish. Their jewel-like beauty shine radiantly delicious. The first name of the vintage Jack Rose is derived from the once ubiquitous Apple Jack Brandy, which comprised the bulk of the original cocktail recipe. Apple Jack, having lost past popularity, has become harder to find. In my version I use my favorite cognac or brandy, and add fresh apple cider to achieve a delightful spiced apple flavor. Seasonal slices of lemon juice dipped red skinned apple grace my modern Brandied Apple Jack Rose. In a cocktail shaker with ice, add the cocktail ingredients. While reading up on the history of the classic Whiskey Sour, one that evokes fond childhood memories of my parents’ cocktail parties, I came across a respected cocktail author’s thoughts on the subject. “There has been a movement back to the basic blocks when it comes to cocktails. There is something special about the simple cocktails. They are enjoyable and well known from a customer standpoint, and easy to assemble from behind the bar.”* I whole hearted applaud this sentiment and think that holiday specials can be a welcome exception, given the same author’s next observation. “There are some historians that believe the sour category is a scaled down version of the basic punch. It has the elements of ‘one sour, two sweet, three strong, four weak’ that a classic punch has, but in an individual serving size.”* With all of that said, I open for viewing the creative process of my rendition of a holiday Spiced Cranberry Cognac Cocktail - no special gadgets required. As per the cognac cocktail theme of my holiday beverage mission, I swap in cognac for whiskey and my spiced cranberry-honey simple syrup for traditional cane sugar simple syrup. I check my recipe to see how it stacks up to the basic punch proportion, noting that mine is lacking in the ‘weak element’ quantity, making my recipe a bit stronger, just the way I like it. Exchanging the sweeter seasonal Mandarin for orange juice, employs it as both a weak and a sweet element, allowing for less of the syrupy sweetening agent in my concoction. You can use more if you like. With no further explanation needed, here is the recipe for my Spiced Cranberry Cognac Cocktail. Make the spiced cranberry honey syrup by boiling the ingredients in the water until the berries burst open and color the water. With a fine gauge seive, strain the syrup of all fruit seeds and spices. Add all of the Cranberry Cognac Sour ingredients to the blender. Blend until well mixed and frothy. Pour into 4 cold, rim ready glasses. Garnish with a cinnamon stick, star anise and a sugared clementine twist. You can also float a couple of sugared cranberries for extra dazzle. Eggnog is one of my all-time favorite winter holiday treats. I admit that eggnog is great with or without any added spirits, but my preference is with a hefty dose of cognac and a fragrant dusting of freshly grated nutmeg. In my newest special spicy version I steep the milk with honey, cloves and cardamom for an exotic twist on a classic recipe. The fun begins with carefully cooking the egg yolks into the mixture without turning them to scrambled eggs. It may seem daunting, but it merely takes a careful eye and a studied attention span for only about 3-5 minutes, stirring over low heat all the while. Once completely cooled, and only then, do you add in the oh-so-rich heavy cream and yummy caramelly cognac. Adding spirits to hot liquid will evaporate the alcohol, though it will not diminish the flavor. Combine the milk, honey, cloves, and cardamom in a saucepan. Heat on low for about 5 minutes to infuse the milk with spice flavor. Do not boil. Strain the cloves and cardamom pods out of the mixture into a wide rimmed pitcher. In a large bowl, whisk the egg yolks well. Very slowly and gradually whisk the hot milk into the egg yolks. Pour the mixture back into the saucepan and cook over medium heat, stirring constantly until it thickens, about 3 - 5 minutes. Do not allow the mixture to boil. Pour the mixture back into the pitcher. Cover and it let cool completely. Stir in the cognac and cream and cover tightly. Refrigerate overnight. Serve chilled with a dusting of freshly grated nutmeg over each glass or cup. This über rich dessert cocktail is inspired by my love of everything cheesecake. After all, what is not to love about cheesecake, except maybe all of that sugar? I swap in a bit of healthful honey for just a touch of sweetness, replacing gobs of granular cane sugar in classic cheesecake fare. Having made cheesecake in many manifestations, including blueberry cheesecake ice cream popsicles, I have found that it is essential for me to include graham crackers for those taste-bud textural memories to swirl the dreaminess of my psyche. I incorporated graham cracker crumbs into the honey swirl inner glass garnish and rim, and a graham cracker cookie to dip into the orange cognac cloud and munch. Feel free to serve this cocktail concoction with as many graham cookies as you like! You can even layer crumbs in between the clouds as you fill the glass, if you are a big graham fan. Most importantly, enjoy your play in the clouds. Crush one of the graham crackers into crumbs for rim garnish. Break the other 2 crackers into quarters for added garnish. One glass at a time, with a fine tipped small squeeze bottle, swirl thin whirls of honey on the inside of a glass. Immediately toss a teaspoon of graham crumbs into the glass to stick to the honey streaks, shaking out the excess t use in the next glass. Repeat until all of the glasses are prepped and in the freezer. Put the honeyed glasses upside down on waxed paper in the freezer to harden the honey. With an electric hand mixer, beat the cream cheese and sour cream in a medium size bowl until very creamy smooth and lump free to make the cheesecake base. Beat ¼ cup of honey into the cheesecake base until it is homogenous. Beat in the whole milk, cognac, orange liqueur and vanilla extract to make the base into a cocktail consistency. Fold the whipped cream into the cream cheese cocktail mixture and chill until ready to serve. Optional: Dip the rim of each glass into remaining graham cracker crumbs for extra texture and flavor. Pour the chilled cognac cheesecake cloud cocktail into the prepared frozen glasses. Garnish with graham cracker quarters and serve immediately.